The Westinghouse 7801665 Comet is our best indoor ceiling fan, which has an air flow of up to 5,199 cfm and has an efficiency of 81 cfm per watt. It comes with a light kit of two bulbs at 40 watts each. With 3 fan speeds, it can be used for rooms up to 360 square feet and uses only 61 watts without the lights. Our step-up pick is the Hunter 59247 Dempsey and it has very low noise and gives you cooling power year round. It has a flush mount design so it is good for lowered ceilings. If you want a contemporary design for your ceiling fan then this is one of the best out there. Rated for use in 120-volt systems, it has a discreet style and sleek look. The budget pick is the Hunter 52090 Watson and this fan has a reverse feature for the winter and has an option for angled mounting as well. Including 2 candelabra bulbs at 60 watts each, it has a downrod design, which can be suitable in most homes or offices as well as in similar rooms. An indoor ceiling fan is a kind of fan that is situated for indoor use. You can find or use them in your bedroom, living room, recreational room, kitchen, basement, attic, office, shop or any other commercial establishment. They come in various designs, colors and wattages and they also come in different blade sizes and numbers. The different kinds of indoor ceiling fans include the flush mount ceiling fan and the traditional style that has a downrod. 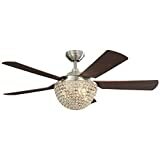 The flush mount sits closer to the ceiling of your home or office so it is more of a low profile indoor ceiling fan but the blowing power is not as good as the downrod type of ceiling fan. These two have their own differences and their pros and cons for various situations or home and office setups. Do remember that a ceiling fan that is meant for indoor use will not be suitable for outdoor use. This is because of the fact that the fan blades may be flimsy for outdoor use such as if they are given a wood grain finish. Moreover, the sun and rain can make the blades brittle over time so they will eventually crack and cause potential injury when you use them. Ease of use or control: a good indoor ceiling fan is one that is easy to control, either with a remote control, a pull cord operation or a wall control. This makes it simple to handle the ceiling fan whenever possible, especially for its speeds. Ease of setup: do consider an indoor ceiling fan that provides a simple setup so you can mount it onto your ceiling with great ease. It should have decent user instructions so that it will not be too tough to mount it onto the ceiling. 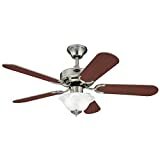 Number of blades: the number of blades in an indoor ceiling fan should also be considered because it can affect the performance of your fan and its cooling ability. Size of the blades: the size of the blades can also affect the blowing power of your indoor ceiling fan so you should pick one with larger and longer blades if you need to place it in a commercial room or large area. Design and color choices: you should consider an indoor ceiling fan that has the right color or design that suits your indoor area or room so that it will look aesthetically pleasing overall. This is important so that your fan does not deviate from the design of your home, office or commercial area. Energy saving and wattage: you should consider an indoor ceiling fan that does not consume a lot of energy or electricity so that you will not have too much to spend on your monthly bill. Do consider one that is Energy Star verified and one that is also ETL listed for safety. In addition to that, a UL listed indoor ceiling fan can also mean that it is not only safe but also energy efficient. 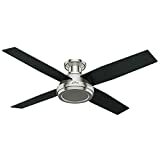 The Westinghouse 7801665 Comet is our best indoor ceiling fan which has a total of 5 blades. You can choose from a wide range of finishes including matte black, pewter, espresso and white. It has a durable cold rolled steel motor and has a reversible speech for winter use. The span of each blade is 52 inches and it has a frosted glass container for the light kit. It has a transitional design and can be controlled using a pull chain mechanism. It has a 2-year parts and lifetime motor warranty. While not a deal breaker, the Westinghouse 7801665 Comet does have small caveats, such as the fact that it is not as powerful as more expensive indoor fans, but it is great for small to medium sized rooms anyway. Our step-up pick is the Hunter 59247 Dempsey which is ideal for low ceiling homes and rooms. With a blade span of 52 inches, you have a choice of brushed nickel, white and bronze for the finish. It is remote controlled and has a reverse mode for the winter season. With an air flow of up to 3,441 cfm, this variable speed indoor ceiling fan has a total of 4 blades in its design and is also ETL certified. Our budget pick is the Hunter 52090 Watson, which has nickel, bronze and white finish choices to choose from. It has a total of 5 walnut blades that measure 34 inches each so it is good for really small homes and spaces. With a total of 3 speeds, it has an easy to use pull chain and an air flow capacity of 3,516 cfm. It is backed by a limited lifetime motor warranty. The Westinghouse 7877365 Richboro has a total of 5 blades and can cover up to 144 square feet of area. It comes with 2 candelabra bulbs and a reverse switch for the whole year’s weather changes. It has an efficiency of 68 cfm per watt and an air flow of 2,995 cfm, making it energy efficient. The Hunter 52090 Watson has a formal design and comes with five 52-inch blades made of cherry walnut and barn wood. With a reverse mode and easy pull chain for adjusting the speed, it has a blade pitch of 13 degrees for better air flow. The Home Decorators TidalBreeze features 3 powerful blades that can cover rooms up to 20 x 20 feet. The blades have a distressed koa finish and made of durable ABS material. The LED light consumes only 14 watts of power and is dimmable as well. The Home Decorators Federigo spans 48 inches for each blade and the included LED light consumes 17 watts of power and emits 822 lumens for making it a light source in your home or room. It has 3 speeds plus a reverse option and has a brushed nickel design. The Hunter 53333 DoneganOnyx has a total of 4 blades, all with 52 inches of blade span. There are 2 bulbs included, both LED and at 9.8 watts for low energy consumption. It has a reverse mode for winter updraft needs and it has a stylish lighting design with its amber glass cover. The Harbor Breeze Parklake has a total of 5 blades that measure 52 inches each. The light kit included is very stylish and can act like a chandelier. With an airflow of up to 5,540 cfm, it is ideal for large rooms such as those more than 400 square feet. 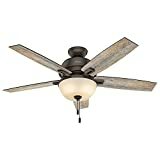 The Westinghouse 7214100 Harmony has only two blades, which makes it unique out of all the fans we have reviewed thus far. It has an opal frosted glass cover for the light kit and spans 48 inches for each of its blades. It has a max airflow of 4,881 cfm and has an efficiency of 92 cfm per watt. Other indoor ceiling fans were not in this list because they were not very easy to set up and were also flimsy in their material. It is important for an indoor ceiling fan to be highly durable and also simple to mount onto your ceiling. Q: What does it mean by being damp rated or wet rated? Damp rated fans are ideal for those with humid areas, such as those in tropical areas. If your home is prone to rusting and corrosion for metal parts and appliances then a damp rated fan is your best choice for an outdoor ceiling fan. Wet rated fans are more ideal for those who often experience rain, snow and wind, even more than just being in a damp climate. Such fans are more durable and can have specially designed motors and are ideal for wet elements and outdoor settings. If your fan does not fall into these categories then they are best only for indoor use, such as for your bedroom, kitchen, living room, basement, attic, guest room and the like. • Your motor can short circuit, which can potentially cause fire because of its exposure to the wet elements. • The blades of the ceiling fan can also easily break due being brittle because of the elements, such as too much sun or rain, especially for wood blades. Q: How do I know if an indoor ceiling fan can save up on costs in the long run? Invest in a ceiling fan with a high quality motor to last for the many years to come. The motor should be sealed so that it can be easily protected from the elements. This is crucial so that your motor does not easily break down with the passing of time, especially if you live in a highly polluted area where dust and debris often gather in your home. It pays to have a powerful motor for a large room/area. Consider an Energy Star rated or certified ceiling fan that has a top air flow of 5,000 cfm and a lowest air flow of 1,250 cfm. An Energy Star certified fan makes it ideal for energy saving as it does not go beyond expending too much power and electricity for your monthly bill. An eco-friendly and bill friendly solution for your indoor ceiling fan must be kept in mind. Look for the Energy Star sticker on your fan. Look for a good length of blades so that they don’t easily get broken depending on where you will use them. Longer blades are ideal for those who have bigger rooms so that the air flow can be moved at a greater force. You should consider measuring your room first before you buy an indoor ceiling fan so that the indoor space will be a good match to your ceiling fan’s blade span or length. The finish and material of the blade can also help you save up on expenses when you pick a durable one. A blade can be made of wood or metal material and some are made of durable plastic – it all depends on which is your preference, but you should go for wood or genuine wood for indoor ceiling fans because they last longer and do not make a lot of noise in general. Do consider the warranty period of the ceiling fan before buying. The warranty period for the motor can be different from that of the parts so make sure you know about this first. Some high quality ceiling fans can have a limited lifetime warranty for their motor and 2 to 3 years for the parts. This is so that you can return it in case there are difficulties and bent parts of the fan that makes it wobbly. Q: What are the benefits of having a ceiling fan? The energy efficiency of a ceiling fan is better compared to that of an air conditioner alone. It is best to have a fan that has 3 to 4 blades for better efficiency when it comes down to making it spin better with less energy per month. Choose a ceiling fan with minimal blades, but not too minimal, to make sure it generates the right amount of air flow for your home or area. The modern design of the ceiling fan can make a clean look for most homes, offices or areas. If you are looking for a modern design or a minimalist look, there are many ceiling fans out there that have that kind of design. Look for whites and silver finishes for your ceiling fan if you want that kind of look. Noise levels are also very minimal for most ceiling fans that have fewer blades than others. The noise level of a blade can also depend upon its material so make sure you choose materials such as wood and the like. Metal blades are ideal only for outdoor use while indoor fans will usually be made out of plastic or wood for less noise levels. The warranty policy for most ceiling fans are also pretty lengthy, especially if the motor is covered by a limited lifetime warranty in most expensive brands. The parts can have as much as 3 years of warranty coverage but the motor usually has more warranty periods for your peace of mind. Q: Does the number of blades on a ceiling fan affect the performance of your fan? The length of the blades can affect the fan’s speed other than the number of blades. The speed of the fan can go slower if the blades are too long versus ones that are too short. In this manner, you need a powerful motor to drive the blades, both when it comes down to the length and in the number of blades available in the fan itself. The material of the blades can affect as well due to its weight. Some materials are heavier than others, such as metal over wood over plastic. Metal is the heaviest so they are only ideal for outdoor use due to the noise level as well as the weight, which requires a powerful motor to drive them. The motor used in most indoor ceiling fans made with plastic or wood materials are usually just right with their speed. The motor of the ceiling fan can also affect its performance, and should be proportion to the blade length and number of blades as well. One of the key differences to look for is the cfm or air flow as well as the power consumption or wattage. • The wattage should be minimal in order to save up on energy costs, but this can’t really be avoided if your ceiling fan requires a more powerful motor to drive the ceiling fan blades faster based on their size and their material, as well as the number of blades in a fan. • The air flow is measured in cfm and is important when selecting an indoor ceiling fan. The air flow should not go over the requirements of Energy Star when it comes down to the lowest and the highest possible air flow value for each fan speed. Q: What are the correct ways to measure a ceiling fan? Q: How do you make a ceiling fan easier to maintain and to operate? Get one with a wireless remote control. Most people who prefer convenience don’t want a wall control or a pull cord control. Instead, you can go modern with a remote control for you to easily control the speed of the ceiling fan whenever possible – just don’t lose that remote. This solution is ideal for busy people as well as for seniors who can’t easily pull down the cord. Get one with custom blade replacements. Having blade replacements for any brand of ceiling fan is vital for those who want to add a styling touch to their home each year or season. For instance, you can set a different look for your home in the summer and different one in the winter. Some can have a set of white blades and traditional oak blades so you can interchange whenever possible. Get one with light fixture compatibility. Having a light fixture or recess in your ceiling fan makes it easier to install a lighting solution for your ceiling fan. This is important for those who also want supplementary lighting for their home or area. Q: What are the different kinds of materials I can pick for a ceiling fan blade? 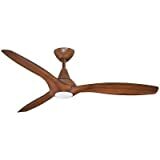 Wood is the most common of all ceiling fan blades due to the ability to be styled and to complement your wood furniture such as your chair legs, tables and whatnot. Wood blades can have different kinds of finishes and different wood species can also have a different texture depending on what you order. • Wood is very stylish and ideal for those who want an antique or traditional look. • Wood is quieter than metal or plastic when it comes down to the noise levels of the ceiling fan in general. • Wood can be situated on almost any home due to the versatile design options for it. • Wood is not ideal for outdoor use or for climates that are too hot, since they can warp or rot in the elements. • You need to watch for fans that don’t use genuine wood and only use MDF or medium density fiberboard, which aren’t very durable compared to real hardwood. Plastic is another type of material that is mostly seen as a budget option for those who cannot afford wood ceiling fans or metal ceiling fans. They are lighter and are available in a wide variety of color choices and styles. Plastic is mostly seen in some contemporary homes. • They are ideal for minimalist designs of homes or offices. • Plastic is the cheapest of all, so they are ideal for budget savers. • They come in a wide range of choice colors and styles to apply to your home or office. • Some of them can resist moisture and rain so they can sometimes be okay for outdoor use. • Most plastic ceiling fans are not ideal for outdoor use, especially in high heat areas due to the potential of warping and/or cracking. • If your plastic ceiling fan is colored, there is a tendency that the color might fade away when it is always exposed to sunlight. • Some plastics are not very durable compared to metal and wood, since they are cheaper. Wicker or woven native material is ideal for those who want a unique design for their ceiling fan. It is basically like a traditional hand fan made from native materials found on most agricultural countries but are innovated to become blades of a ceiling fan. • They look stylish and unique, and are perfect for antique homes. • They can be ideal for kitchens to easily sweep the bad odors away. • They are ideal for summer homes and hot climates. • They are not ideal for the rainy days due to their traditional material, much like wood. • They may not last long enough compared to wood, plastic and metal, when it comes down to durability. • They can be hard to find, compared to other materials, so they may be slightly more expensive. Metal is a less popular choice for homes and a more popular choice for industrial places and commercial establishments. They are made mostly of metal material and can also be a good choice for some who want a minimalist design. • They are excellent for outdoor use due to the durability and weatherproof qualities. • They can generate more air than the other materials can. • They are the best for shops and commercial use, as well as for industrial purposes. • They produce more noise, so they are not ideal for small spaces. • If the metal is not rustproof then it is not suitable for humid areas. Q: What are the pros and cons of ceiling fans versus pedestal or floor fans? Portability You can’t put it away when you don’t need it anymore, since it is permanently installed. You can easily put it away when not needed, since it is a free standing fan. Ceiling height Not ideal for very low ceilings lower than 7 feet. Hugger fans or flush mount ceiling fans are okay but anything lower than 7 feet is not okay. If you have a low ceiling that is below 7 feet then a floor fan is your best choice for safety purposes. Expenses Ceiling fans are usually more expensive due to the installation and the upfront cost of the fan itself. A pedestal fan is usually cheaper than the ceiling fan and they also don’t really need to be set up at all. Lighting Ceiling fans have a lighting fixture option for adding décor to your home. Pedestal fans do not have this option. Noise levels If you buy a quality ceiling fan, it will give you less noise problems. Some pedestal fans that are of low to medium quality might have noisy motors, especially old ones. Style options Ceiling fans are available in a wide variety of fan blade styles and materials to choose from. Pedestal fans also have a wide variety of choices for colors and designs. Warranty option Ceiling fans usually have better warranty policies due to being more expensive than pedestal fans. 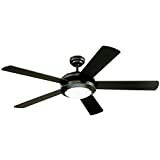 Some pedestal fans have good warranties, but it depends on their price and style. Q: What finishes are available for my ceiling fan? In addition to that, certain ceiling fans that are made out of other materials such as plastic can have various color choices for you to choose from. Q: What is the reversible feature and why is it important? A: The reversible feature is the feature found in a ceiling fan that can allow it to move the other direction to create a different updraft during the winter. This is important for homes that have four seasons or extreme hot and cold climates, so they can save up on heating costs in the long run. Q: What are the most common problems encountered on a ceiling fan? If the fan doesn’t work but the lighting works: this means that there might be something wrong with the motor of your ceiling fan, and you might want to buy another ceiling fan because motor problems can’t really be solved unless you go for a new unit. If your lighting doesn’t work but the fan works: simply replace the light bulb or check if the bulb is properly installed when you turn off the fan. Alternatively, you may have a defective light bulb, so it is best to check with an electrician first. You should also keep the receipt of your light bulb or fixture if ever that is the case. If the fan does not turn on: you could have problems with the wiring or the wall switch, in which you can call an electrician to help you determine the cause of the problem. This is one of the most common malfunctions of a ceiling fan. If your fan wobbles: you could straighten out the blades or check for signs of loose roof joists. If you are not very sure with this, you can contact an electrician or handyman to get the wobbling problem away. If your fan does not give enough cooling breeze: you could switch it in reverse, if your fan has a reverse function, so that it will spin the other way around. This is also helpful for the winter when you want to create an updraft. If your fan smokes or gives off an alarming screech: turn it off immediately. You can get a repairman or electrician to look for the cause of the problem. If it is not capable of being fixed, you will have to go for a new unit instead. Q: Do all ceiling fans need to be oiled on a regular basis? A: It depends on the design of the fan and its motor, so it is best to check the user’s manual if the lubrication system of your ceiling fan is automatic, meaning that the motor is sealed and constantly lubricated at all times. This means that you do not need to oil it regularly. Q: Is it possible to use one remote control or one wall control for 2 or more fans? A: It depends on your units but the best way to go is to have separate controls. This is because the frequency of one remote or wall control would interfere with the other and they cannot always turn on simultaneously due to various factors, such as signal blockage. Therefore, you should just get separate remote controls or wall controls for them. Q: What possible things can I do if the fan is not working? • Inspect the reverse switch. If the switch is in the middle, which is the neutral position, it can cause the fan not to work. • Know if the breaker has power that goes to the wall control and to the wall switch. • Check the blades if they do not have anything blocking the way, such as dirt, dust and debris. • If your remote control’s batteries don’t have power (you can test this with other items or have a multi meter to test it) then you simply need to replace them. • The circuit breaker might have been tripped, so do check it as well. • The fan canopy might also have some loose connections. Q: What batteries do work with an indoor ceiling fan’s remote control? A: It depends on the manufacturer but you will mostly have to supply AAA batteries for it, much like with air conditioner remote controls. You can either use disposable ones or rechargeable ones. • If you are looking for convenience then disposable batteries are ideal for you, as they usually have more power packed into them. The only downside is that they are not very eco-friendly when they go into the trash can. • If you are looking for an eco-friendly solution then rechargeable batteries are the best for you, as they can get reused for as long as you can. The only downside is that they are a hassle to charge every now and then. 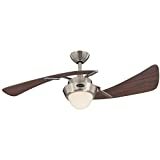 Q: What are the pros and cons of metal and wood/timber blades for a ceiling fan? Noise level Metal blades are noisy so they are only ideal for large rooms or outdoors. Timber or wood blades are quiet in general so you can place them in the bedroom or small room. Air movement Metal blades are better and more powerful when it comes down to moving air in the room. Wood blades are not very efficient in moving air as compared to metal blades due to the design. Indoor or outdoor Metal blades are the best for outdoor use because of their noise level and material durability. Wood blades can rot in extreme weather and are quiet enough to be situated indoors. Q: What are the benefits of a DC ceiling fan? DC fans are generally quieter than AC fans because of their motor design. This design makes them super applicable for homes that require quiet time, such as those with babies who need to sleep and rest without disturbance or background noise. DC fans are favorable for those who want to install an indoor ceiling fan in their bedroom, especially in a kid’s room or baby room. DC fans can help you save up to 70 percent less energy on a monthly basis. The energy consumption of an average DC fan is remarkably lower than that of an AC fan, which is important if you want to save up on electricity each month. They have a longer lifespan as compared to AC fans. This is because the motor remains cool with the design of its internal operation. The less noise also means that the motor can live longer. This practically means that you are saving more money in the long run with an indoor ceiling fan that runs on DC, even if it does cost a little more on the upfront expense. Q: What can affect the cost of having a ceiling fan? • How the fan is controlled: If you’re buying a remote controlled fan then it is most likely pricier than a pull cord. At the same time, if you go for a wall control system then it requires some installation fees from an electrician as well. • Your existing wiring system: if you don’t have a wiring system that is already set for a ceiling fan then you will also need to contact an electrician and spend some cash for the installation and wiring. • The attic of your home: if your home has an easy to access attic then the electrician won’t have much problems, otherwise it could be a nightmare when you want to install a ceiling fan. • Height of your ceiling: do consider if the height of your ceiling is at least 7 feet and above. If not, just go for a regular fan such as a wall fan, desk fan or floor fan instead, as it might not be safe. Likewise, sloped ceilings require a different adapter as well. Q: Who can install a ceiling fan? A: An electrician who is licensed and properly trained can install your ceiling fan, so you will have to prepare some installation fees. On the other hand, if you are knowledgeable or you are an electrician yourself, or someone in the family knows how to do it, you can always DIY install it. Q: What do I need to check if my fan is wobbling? • Blades: make sure they are well-balanced and they don’t have bent blades or warps. The holders should also not be loose. • Hardware: the mounting hardware should be properly installed as well. • Junction box: the junction box should be secure and its screws should be in just the right tightness. As a whole, the Westinghouse 7801665 Comet is our best indoor ceiling fan with its efficiency of 81 cfm per watt, reverse feature for the winter and long enough blade span for better air flow.